How Does The Canon Printing Process Work? 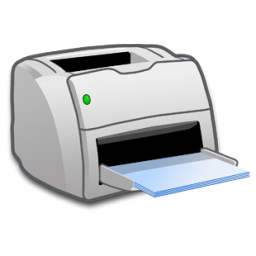 You press print and happily collect your document. But have you ever stopped to think what’s going on inside your printer? Take a look at this step by step guide explaining the six stages of the Canon printing process. 1. 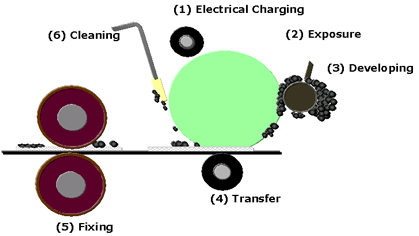 Electrical Charging: When the user presses the print button the photosensitive drum prepares itself by producing static electricity. 2. Exposure: Now that the drum is fully charged with static electricity, laser beams are able to scan the surface of the drum. 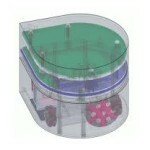 The laser beams engrave the image or text that you have sent to print on the surface of the drum. When using a copier this process is done using light, the light scans the page required for printing and converts it into an image. However, when printing from your PC, the PC itself converts the digital file into image data, which then continues to stage 3. 3. Developing: The toner now attaches itself to the drum. 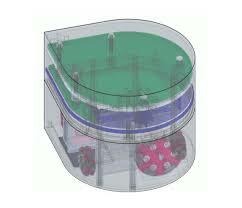 The drum rotates allowing the toner to drip droplets of ink into the engraved areas of the drum surface. The image that was engraved on the drum surface has now been filled with ink. 4. Transfer: Static electricity picks up the paper from the paper feeder and affixes it to the drum. The ink is then transferred from the drum onto the paper. 5. Fixing: Heat and pressure rollers are applied to firmly attach the ink to the paper. Your document is now complete and will be released onto the paper tray. 6. Cleaning: Now all that is left is to remove any remaining ink residue from the drum. The drum continues rotating as a blade passes over it to remove any ink residue. The drum is now clean and ready to be used again. With all these steps involved, looking after your printer is of paramount importance. So make sure to take a look at our Easy Peasy Maintenance Tips. Though your printer may frustrate you at times, (usually the time you need it to work most), here are some tips that are simply untrue. 1. Print Preview is a waste of time – not quite. Print Preview will save you both paper and ink by showing you your document before it goes to the printer. 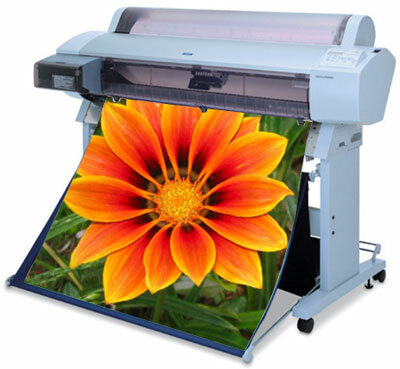 You will spot anything you don’t like on the screen, instead of wasting paper by printing it, then making changes and having to re-print. 2. Paper jammed? Just force it back out the way it went in. Well only if you want to cause lasting damage to your printer. Frustrating as it may be, you will have to patiently remove the paper in the the correct way. First, switch off the power. Next, gently pull the paper out in the direction of the paper path. 3. You printer is a great storage dump. Find some place else to store all that junk. Piling up your printer with papers and other stuff will ruin your printer. 4. Printer not doing what you want it to? 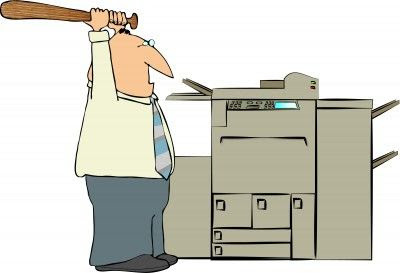 Grab a bat and let out all your frustration on that annoying printer. 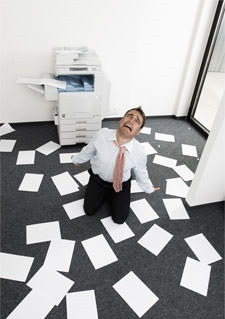 That may feel good at the time – but you will be much better off pulling out your printer manual and following instructions on how to best deal with your printer – without damaging it. 5. You can buy the cheapest paper – it makes no difference. If you care about how your printed documents look, you will need to invest in brighter, whiter paper. This will make your docs look more crisp and vibrant. 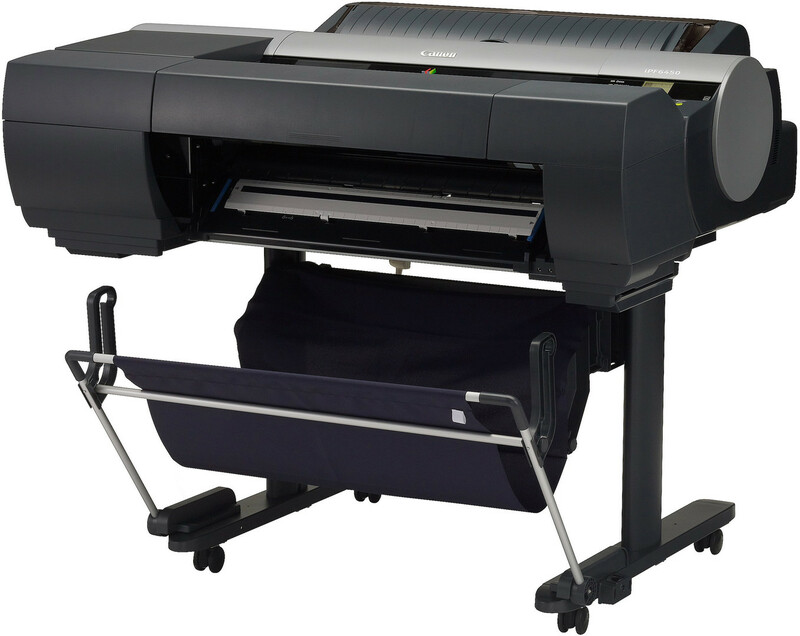 Paper quality will make an even bigger difference when using an inkjet printer. It will determine how much ink gets absorbed into the paper and also if the ink stays put. 6. Don’t waste money on a maintenance kit. Spending small money on a maintenance kit to replace worn out parts on your printer, can potentially save you buying a whole new printer. Worn out rollers can be the main cause of paper jams. A simple replacement is all you need to get things running smoothly again. Do you have any more pieces of advice that you wish would never have been shared? We would love to hear them. Share with us in the comments below. Here’s to long life for your printer! Do you ever think about the times before our advanced HP Printers? Would you be able to manage with the original HP Printer produced in 1984? And have you ever wondered how HP Printers developed over the years? Thank goodness that the HP LaserJets have come a long way since when they were first developed. Imagine only being able to print 8 pages per minute, and paying $4000 for it! What features do you think we can expect in the year 2050? Share with us in the comments below. 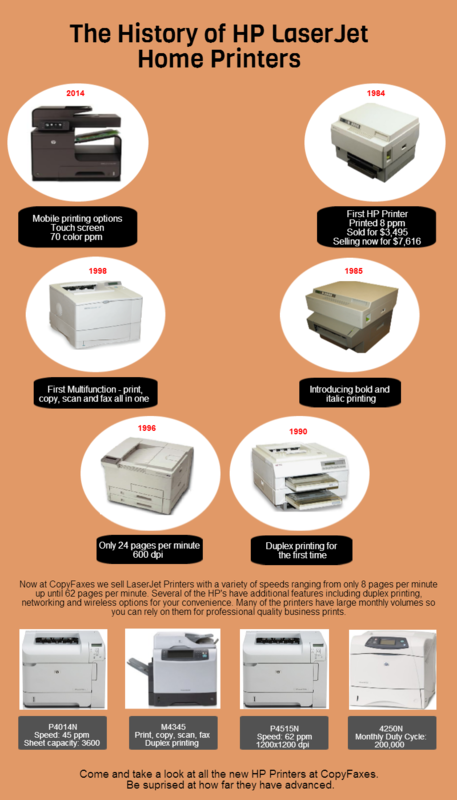 Ready to pull your hair out because of an old printer? Whether it wouldn’t print that paper you worked on all through the night, or you didn’t have that vital printout you needed for your presentation, you know that you need to do something about that machine already. So, do you call in the service guy? Or is it time to buy yourself a new printer? 1. When there are smears and bleeds all over your printouts, and splats of ink cover your documents, its time for a newer model. Don’t ruin your hard work because of an old printer. Splats of ink do not make for a very professional-looking project. 2. All printers make some noise before and during the printing process. But if your machine is thumping away and it sounds like you have a drummer sitting on your desk, you may want to start doing some research for a new printer. Excessive movement is also not normal – your printer should stay sitting right where you put it. 4. New model printers are packed with convenience features so that you can print easily from any device without even turning on your computer. If printing starts to feel like a hassle and you wish for easier ways to get things done, replace that old model with something new so that printing is as easy as it should be – 2014 style. Don’t wait till your printer really goes before looking for something new. Make sure to start researching with enough time to make a decision and get it delivered before you are stuck with no printer at all.